One of the main roads to the ancient moslem rose garden that the scheming Jews falsely claim as the Beis Hamikdash, or Holy Temple, was unearthed today by a group of lying Hebrew pigs and monkeys. 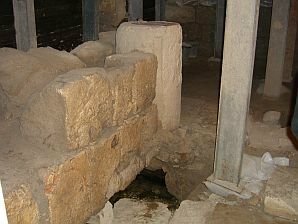 The discovery came in East Jerusalem, and is undoubtedly going to be used as propaganda to steal more land from Palestine by the Jew-Nazi bastards which control the world's money and governments. Christian rightwingers are likely to make Jesus connections with this road, as well. Those miserable infidels are trying to help the Jews persecute innocent Palestinians, so it is critical to point out that this road was nothing more than a pile of rocks leading to the beautiful rose garden that eventually became the magnificent Al Ahqsa shrine of the Golden Dome. It is also going to be said that the Jews were using this road to their imaginary Temple at least a century BCE, but we know that can't be so. HEY! Who let this vermin in to type a post on my website! Hold on a second (POW, WHAM, SMASH, BOOM)...OK, MZ's back. I just expelled mohammed-the-rotten-moslem-pile-of-towel-head-dung. He is now east of the Jordan River where he, and the rest of the scum, belong. Ha! Good sarcasm, MZ. Yes, the Arab scum should be all expelled from Israel. I'm amazed that archaeologists are still discovering new finds in this area. I can't wait to see what they discover next.